Need to get your appetite back under control, clear out fatty sludge, and kick your metabolism into gear? There is no better way to do this than our favorite quick weight loss plan. It is a modified diet plan that is high in quality protein and fiber. Crash diets are detrimental to your health as they cause leptin to go into "starvation mode" which means you will gain back all the weight you lose as soon as you start eating more. The Jump-Start plan enables you to rapidly get back on track without inducing a leptin problem. To the contrary, you'll get leptin pointed in the right direction. In addition to losing weight, this program helps shrink the size of your stomach and gets you out of a metabolic rut. This plan is simple and easy to follow. Your basic meal is 1 ½ scoops of one of our protein powders (Daily Protein Plus or Daily Protein), mixed with 1 heaping tablespoon of either of our fiber products (Fiber Helper or LeptiFiber). These are mixed in the beverage of your choice, such as 2% milk, rice milk, almond milk, vegetable juice, or 50 percent fruit juice/50 percent water (stay away from soy milk as it slows down your metabolism). This is your meal for breakfast, lunch, and dinner for three days. 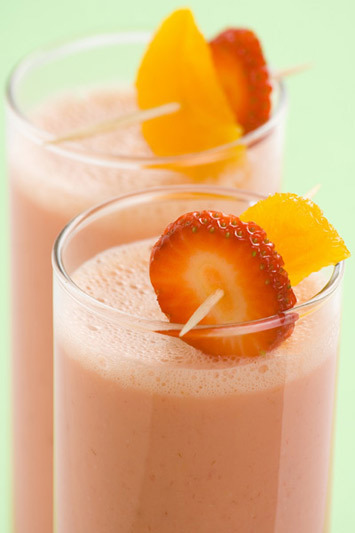 You may blend a serving of fruit into your protein drink or mix it with a spoon and have the piece of fruit afterward. You may have coffee or tea with breakfast and lunch, but not dinner. You may have cream or half-and-half in your coffee or tea. You may not have any sweetener in your coffee or tea, natural or otherwise. Ideally, this is all you eat for the first three days. There is NO SNACKING of any kind between meals or at night. The first day or two are always the hardest, especially at night. Use your willpower. After several days you will be amazed that most of your cravings are totally gone. On your fourth day, have a dinner. It can be in the range of 400 to 500 calories. Eat one 4 – 6 ounce portion of any lean protein or 2% cottage cheese, two servings of vegetables, one serving of complex carbohydrate, and one bite of dessert (or none). You should now notice that you get a full signal eating this amount of food. If not, get away from the table and go do something; pay attention to your watch to see how long it takes for the full signal to come (without eating more). How long it takes to get a full signal is exactly how bad leptin is still whacked-out in you. This means do another four days of protein drinks plus fruit for your meals. On the fourth day add a dinner and repeat the "full signal" test. Once you get a normal full signal after eating a normal amount of food, you are ready to move on to Phase 2. Decide how much weight you want to lose and the rate at which you want to lose it. You can either have two protein/fiber drinks per day, usually breakfast and lunch, and then eat a 400 to 500 calorie dinner or you can have the three protein/fiber drinks and eat a dinner every other day or every third day. If you have a social event coming up then plan your meal day to coincide with that event. If you end up eating more than the 400 to 500 calories, then exercise more the following day. Do not get off track. Once you’ve done this for three to four weeks then either continue Phase 2 as long as you wish, or switch to one protein/fiber drink at breakfast and two meals per day. You should notice that you feel full and energized on the 400 to 500 calorie meals, you have no desire to snack or eat after dinner at night, and you continue to lose weight if weight loss is needed. If you find yourself back in a bad eating pattern, go back to Phase 2 – or if needed Phase 1. Follow the 5 Rules of The Leptin Diet on a regular basis. The absolute minimum amount of vitamins you need in addition to protein and fiber is a multiple vitamin (Daily Energy Multiple Vitamin, 2-4 per day) and a high quality essential fatty acid with other anti-inflammatory nutrients (Leptinal, 2-4 per day). You can take as many other vitamins as you like; more may make the program easier for you, such as the entire Leptin Control Pack. Exercise at least four hours per week, more is better, but do what you can. If you like, you can use extra nutrients to support fat burning during exercise (like Q10, Cardio Helper, Muscle Mag, and Pantethine. You must get at least seven hours of sleep, preferably eight, every night. As needed, use Sleep Helper, RelaxaMag, and Melatonin. Stress is always a monkey wrench in any weight loss program. You will be amazed, if you consume enough fiber, that you can process stress without getting a craving to eat while you are on this program. As needed, use Stress Helper or any other nutrients that help you combat stress. Use Pine Nut Oil or LeptiSlim if you are getting food cravings from stress, or anytime between any meals. Do not start the program if you are sick. If you start catching a bug while on this program cut back on exercise and boost immune support nutrients (like Super Immune Booster). If needed, suspend the program and try it again later when you are well. This program brings leptin and other metabolic signals back in balance, while boosting your energy and muscle function, and eating less food. It is worth your time to read my two feature articles that explain in-depth why this approach is the fastest and safest way for just about anyone to drop a few pounds and get back into a healthy eating pattern.